Tax Defense Network is a tax debt relief service that offers a wide variety of tax services to consumers nationwide. 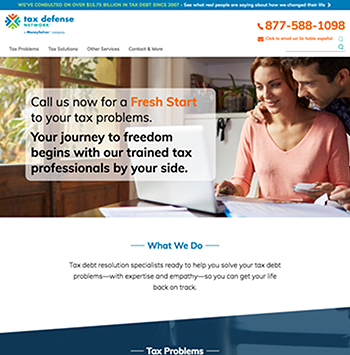 Since 1997, Jacksonville, Florida-based company Tax Defense Network has provided a wide variety of tax debt relief services for consumers nationwide. If you are interested in learning more about their services, you can contact Tax Defense Network for a free consultation. Award-winning service: Tax Defense Network has several awards, including Top Ten Reviews’ Silver Awards for 2016, the 2014 BBB Torch Award for Ethics, and a 1A1 rating and Silver Power Profile from Dun & Bradstreet. Nationwide service: Tax Defense Network’s services are available in all 50 states. Professional staff: Their staff consists of over 70 licensed and certified CPAs, enrolled agents, tax analysts, and tax attorneys who are certified by or members of the American Bar Association, the NAEA (National Association of Enrolled Agents) and the NATP (National Association of Tax Professionals). Their certified tax professionals are qualified to represent their clients in front of the IRS for disputes and appeals. Free consultation: Potential customers can contact Tax Defense Network for a free consultation. Additional services: In addition to their tax relief services, they offer assistance with tax return preparation, student loan debt, bookkeeping, and business advice on their website www.bizsolutionsnetwork.com. Bilingual representatives: Tax Defense Network employs both English and Spanish speaking representatives. Great customer service: Customers have praised Tax Defense Network’s friendly, professional, and knowledgeable staff. Additionally, they also have a customer service department for their clients called “Gold Star Client Care,” which encourages any unsatisfied clients to contact them so they can rectify the situation. Money back guarantee: Tax Defense Network allows clients to have a three-day window to receive a money back guarantee. After this, the refund decreases based on the amount of work that has been performed. Giving back to the community: Tax Defense Network also helps natural disaster victims, such as those who were affected by Hurricane Harvey and Hurricane Maria. Customers who qualify can claim a loss and receive a tax credit. While Tax Defense Network does have a refund period, it is relatively short in comparison to their competitors. Most companies offer a money-back guarantee that is much longer than three days. There is no minimum debt required to enroll in Tax Defense Network. Average fees range from $2,500 to $3,000 but can be higher depending on your tax debt amount. Clients have a three-day money back guarantee. Tax Defense Network requires a $500 flat fee, which can be paid according to your ability and preference (for example, splitting it into five $100 payments). The remaining amount of your balance depends on your individual case and can be taken care of with a payment plan with a flat fee. Yes, but it can be much more challenging to pursue it on your own. Tax relief services like Tax Defense Network have knowledgeable and licensed agents who have years of training and education.